Looking for an attractive, affordable, portable trade show booth? 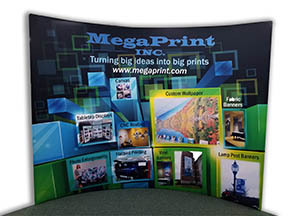 This great trade show booth has a tension fabric graphic that installs over a lightweight aluminum frame. Everything goes into a tough plastic shipping case. 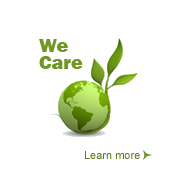 Send us your design as a full size graphic. The graphic dimension is 123-1/8” wide by 92" tall, and should have a 2" bleed around. We prefer you send us a "for print" pdf, with images of 72-100 dpi. Footprint of the assembled booth is 112”wide, 96-1/4” high, and 23” deep, so it will nearly fill the width of a standard 10x10 trade show booth. The graphic panel is a one piece dye-sublimation printed fabric, seamed like a pillow case and fitted with a zipper at the bottom. It slides over the aluminum structure and remains taut to give a smooth, attractive graphic presentation. To order, give us a call on 603-536-2900 or toll free 800-590-7850. Our online ordering system is not set up for this product. Prices effective Nov 1, 2018 and subject to change without notice.